Jazz, jewels, veils, cakes, cucumber sandwiches and 100 happily married couples came together on the 29th May 2011 at the Castle for our 1000th Wedding Party. Sir Jack and Lady Stewart-Clark welcomed 100 of our past 1000 wedding couples to share in the celebration of our 1000th wedding that took place on the 4th December 2010. We knew that we wanted to celebrate in a big way when we reached our 1000th wedding and coincidentally we received a message from one of our past wedding couples Cheryl and Christopher Brind. They asked us if we would ever hold an event for past couples… so armed with the knowledge that this kind of event would be appealing to our Dundas couples, the 1000th Wedding Party was born. The main aim of the party was to bring together as many of our past couples as possible, so that they could have a wonderful afternoon of sharing memories and reliving moments from their wedding days. With jazz and Bellinis on arrival, the guests were able to wander through the house and Auld Keep. Planet Flowers excelled themselves with their dressing of the Auld Keep. Fairy lights stretched up the winding staircase and the window alcoves became home to the most enchanting flower displays in pinks, greens, purples and white. The country, vintage theme in the Auld Keep was the perfect contrast to the medieval feel from the original stonework of this 1416 building, as the guests relived moments from their wedding ceremony in the Great Hall. In the Armoury Chamber of the Great Hall our guests were encouraged to write a note with memories from their wedding day. These notes will be stored in a time capsule which will be buried by Sir Jack in the ‘summer garden’. Some of the notes written were very emotive and we’re sure they will be treasured by the people who find the capsule in the future. Back in the main house, Phil, our pastry chef from Prestige Venues and Events impressed guests by giving cupcake decorating demonstrations in the Croquet Room and Laing the Jeweller bedazzled guests in the Drawing Room with their display of rings, necklaces and watches. From high-end Bulgari watches to £32,000 diamond rings there was a lot of smiling and a lot of ‘gentle’ hinting between our past bride and grooms. Even Lady Lydia dropped some suggestive comments to Sir Jack regarding a particularly exquisite jewelled necklace. Guests were able to be part of Sir Jack’s commemorative tree planting ceremony, where the weather held perfectly for the occasion. And for those who preferred the great indoors, the Winter Bedroom showcased some spectacular Rachel Scott Couture bridal dresses and some stunning hair and accessory pieces. Having viewed the bridal wear, the Dundas brides were able to showcase their own wedding veils for a special photo on the lawns. Niels, part of the very talented Blue Sky Photography team, was the photographer at the party and directed the 100 couples perfectly for a group photo – it was a rare sight to see so many veil clad ladies! The atmosphere at the party was fantastic and we are sure this was helped by the magnificent high-tea buffet laid on by our sponsor and dedicated caterer Prestige Venues and Events. From chorizo bruschetta to mini salmon croissants to handmade popping candy chocolate truffles, there was something to thrill any palate. Beautifully Covered provided some lavish linens that were seen throughout the house and Auld Keep that added a truly personal theme to the party. We have had some wonderful feedback from the 100 couples and Sir Jack, Lady Lydia and the Dundas team enjoyed the day as much as the guests. There were also some lucky prize-draw winners who took away prizes including a day at the Truly Scrumptious Designer Cakes cookery school, a Champagne dinner at the Dakota Hotel and a night at our Boathouse on the Loch, complete with a personal chef. There was one more prize that all of the brides were hoping for… Richard Laing of Laing the Jeweller picked Natalie Anderson’s name from the hat and invited her to their shop in Edinburgh to choose her eternity ring for up to £1,000! No 1 magazine was in attendance at the event and the photos will appear in the weekly publication and online on the 16th June. Scottish Field will also be featuring photos from the party in an upcoming issue. 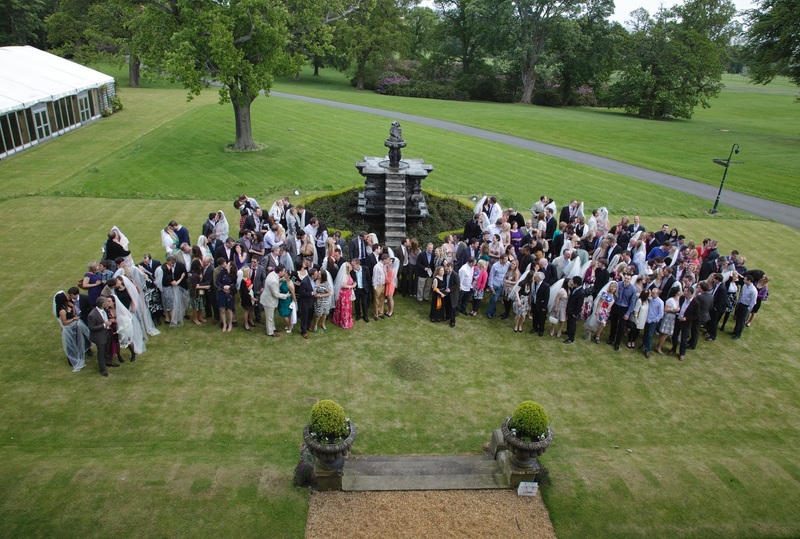 We would like to thank all of our past 1000 couples for choosing to share their special day at Dundas Castle and we look forward to welcoming 1000 more in the future.